As our work environment becomes more and more portable thanks to highly functional mobile devices, it is becoming increasingly necessary to have the best tools on your mobile device to make it easier to work anywhere. When it comes to document processing, this often means apps that are designed to make workflow easier. 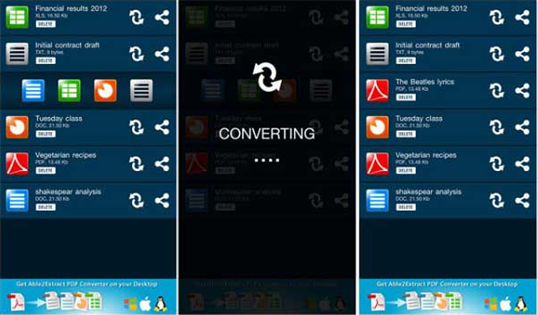 For PDF that often means apps that can be used to manage PDF documents, specifically, apps that can convert files to PDF. It may therefore happen that you have an image of a document on your mobile device that you want to convert to PDF. With an image to PDF App like the ones we will share with in this article, it is very easy to do that. But first, let's take a look at a far better way to manage PDF document on your computer. Abel2Extract PDF Converter is a simple to use PDF converter app for Android that you can use to convert an image to PDF. It is also quite useful in converting other types of files to PDF as well and is very fast. One of your favorite features about this particular app is the fact that you don't need an internet connection to convert the image to PDF. There is also no limit the size of the file that you can convert. It doesn't need an internet connection. Can convert multiple file types to PDF including Word and Excel. You will need to install a PDF reader to view the converted PDF file. You may not be able to convert multiple files to PDF easily. Don't let the name fool you. 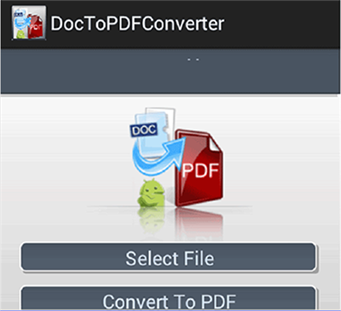 Doc to PDF Converter can convert more than just documents to PDF. It can also convert images like JPG to PDF. Like most apps of its nature, it is fairly simple to use and easy to navigate. 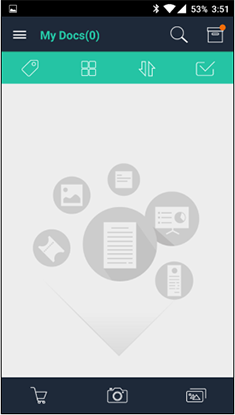 One of the best things about this particular app is that you are able to easily email the converted PDF file from within the app. It has a very simple to use interface. It makes sharing the converted PDF via email quick and easy. It can only convert JPG to PDF; doesn't support other types of images. It may not be useful for the conversion of multiple images to PDF. CamScanner is a free Android app that you can use to convert any image to PDF. The images can either be those on the device or photos of documents. 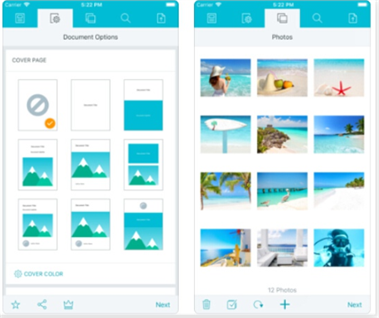 The app goes further, allowing users to take photos of documents, crop the photos and then convert the image to PDF. You can easily then share the resultant PDF from directly within the app. It can be used to edit the image before conversion. It may not be ideal for the conversion of multiple photos to PDF. PDF Photos is a simple to use and highly effective iOS app for the conversion of photos to PDF. The app has a very simple to use interface that make it easy to find what you need and easily convert any image type to PDF. Once the photo has been converted to PDF, you can easily share it using one of the numerous options available including email and cloud storage options like Google Drive. It is very easy to use and has a very clean pleasant user interface. It can convert nearly all image types to PDF. It may not be the best option for converting multiple images to PDF. It lacks PDF reading and editing capabilities. 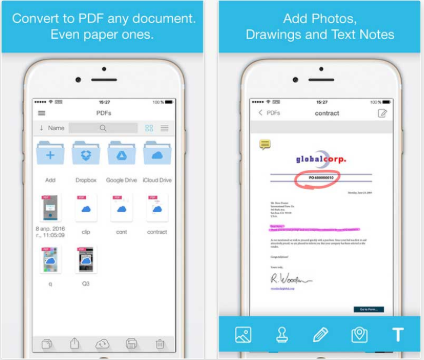 Readdle PDF Converter is an app that is available for iPad and can be used to convert any file to PDF including images like JPG. You can easily download documents from the cloud, the web or email directly from the app and then proceed to convert the file to PDF. Once the conversion is complete, the app also makes it very easy for you share the converted file via email, Facebook, Twitter and other channels. Can convert numerous file types to PDF. It can download files from the web, Dropbox and email attachments. It is only available for iPad. It may not be useful for reading or editing PDFs. To PDF does precisely what its name suggests; it allows users to convert any file type to PDF easily. It can convert images in JPG and JPEG files as well as webpage, emails, contacts and even Dropbox files. You can download all these from directly within the app. It can access files directly from the web or cloud storage options like Dropbox. It is very easy to use and has a very simple to use interface. It is not ideal for the conversion of multiple images to PDF. It lacks necessary PDF editing tools . The above apps are great for a single conversion, but many are not ideal for the conversion of multiple files or provide other necessary and sometimes essential PDF editing features. If you require having more control over how you convert, edit and handle your PDF documents you may require the services of iSkysoft PDF Editor 6 Professional for Mac(or iSkysoft PDF Editor 6 Professional for Windows). 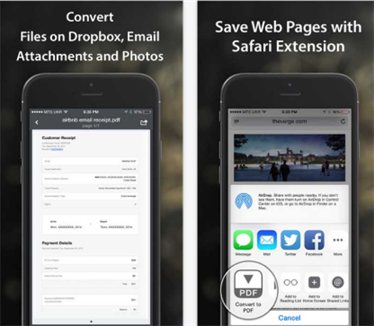 This image to PDF converter app for Mac and Windows does more than just convert PDF. 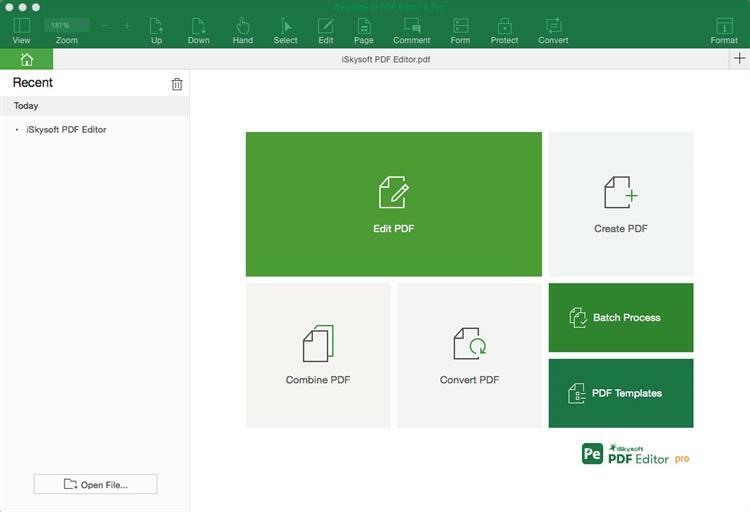 It can be used to create PDFs in a single-click by simply opening a file in the program. It has very useful text and image editing features including a very powerful OCR feature that can allow you to edit scanned PDFs. It also has great annotation features that include comments and custom stamps and the ability to highlight and underline text. You can also merge and combine PDFs for effective document management.